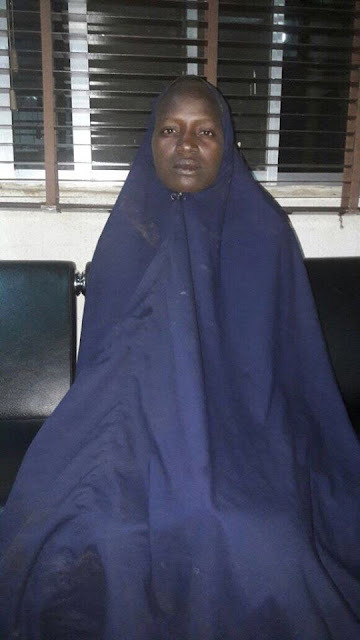 Few days after the rescue of a chibok girl, Amina Ali from Sambisa forest, yet another missing Chibok girl was found by the Nigerian Army in Sambisa forest on Thursday evenung. The Army Spokesperson, Colonel Usman Sani Kukasheka confirmed the rescue of another Chibok Girl this evening. This is coming after the rescue of Amina Ali who was flown to Abuja today where she met with President Muhammadu Buhari at Aso Villa. NigerianEye learnt that the name of the second rescued Chibok girl is Sarah Luka. Colonel Sani Kukasheka Usman said that the second Chibok girl was among 97 women that were rescued by troops of 231 Battalion, 331 Artillery Regiment (AR), Detachment of Armed Forces Special Forces (AFSF) 2, Explosive Ordinance (EOD) Team and Civilian Vigilante group of Buratai. The troops he said rescued her during a clearance operations at Shettima Aboh, Hong and Biladdili general area in Damboa Local Government Area of Borno State. “At about 11.00am today, Thursday, 19th May 2016, troops of 231 Battalion, 331 Artillery Regiment (AR), Detachment of Armed Forces Special Forces (AFSF) 2, Explosive Ordinance (EOD) Team and Civilian Vigilante group of Buratai, conducted clearance operations at Shettima Aboh, Hong and Biladdili general area in Damboa Local Government Area of Borno State. During the operations, the troops killed 35 Boko Haram terrorists and recovered several arms and ammunitions and other items. In addition, they rescued 97 women and children held captives by the Boko Haram terrorists. We are glad to state that among those rescued is a girl believed to be one of the Chibok Government Secondary School girls that were abducted on 14th April 2014 by the Boko Haram terrorists. Her name is Miss Serah Luka, who is number 157 on the list of the abducted school girls. She is believed to be the daughter of Pastor Luka. She added that there other three girls who fled from Shettima Aboh when the troops invaded the area earlier today which led to their rescue. She is presently receiving medical attention at the medical facility of Abogo Largema Cantonment, Biu, Borno State. he said The first of the abducted students to be found, 19-year-old Amina Ali and her mother met President Muhammadu Buhari at his official residence in Abuja earlier Thursday, where the head of state said the government was “doing all it can to rescue the remaining Chibok girls”. “Amina’s rescue gives us new hope, and offers a unique opportunity for vital information,” he said in a statement. Amina was quoted as saying by a campaign group pushing for the girls’ release that all the students were still being held in the former game reserve, where the Islamists have had camps, but that six had died. Nigeria’s military has been mounting an offensive in the sprawling, semi-desert scrubland since late April to flush out rebel fighters. Kinsmen Named Outgoing Nigerian President Jonathan "A prodigal son"